For a few days last week during the latest winter weather, I tackled more of the boxes in my back storeroom. These are boxes of research notes and memorabilia from my mother, my grandmother, my mother-in-law, two great-aunts, and our own lives with children and grandchildren. At one time, boxes filled a spare bedroom, the storeroom, and the shelves in my office. Good news: 11 four-drawer filing cabinets have some empty space. Net result in this latest effort: nine boxes emptied, two overflowing boxes went to the recycle bin, one large garbage bag to the dumpster, a stack to our shred box and the remainder filed. And, I still have room in the filing cabinets for more! While we continue to have items in the spare bedroom, the storeroom and on the shelves in my office, I see hope for getting the remaining items out of the spare bedroom soon. Also, the storeroom is beginning to see “the light of day”… pun intended; this room doesn’t have any windows! What to do with literally hundreds of old letters? Letters Dave and I sent to family and friends during our three years in Germany. It is probably very unusual to have copies of all the letters sent, but I had a typewriter in Germany and had access to carbon-sets… these consisted of 6 sheets of paper with carbon paper between the sheets. I typed a letter every week and sent copies to family members, retaining the final carbon copy for our own records. At least three family members also saved all of the letters sent to them, and now we have those copies, as well. Many times, I wrote individualized notes at the end of the letters to family members, so we now also have those notes. 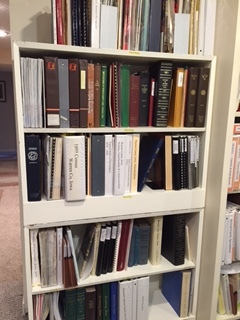 The plan: sort, scan, place in archival sheet protectors, and transcribe. Priority: All (including envelopes) need to be sorted, scanned and placed in archival protection ASAP. Especially important is being sure we have additional copies in case disaster strikes the originals!!! The transcription process can be done later. Over the past few weeks, besides organizing my library, I’ve been sorting through more boxes. In fact, I have emptied twenty boxes! What did I find? What did I do with all of it? Well… One box was filled with Jack and Jill magazines from the 1950s. I looked through some of the issues, then I checked the Internet and found that the magazine is still published and that old issues have very little value. In addition, the issues in my collection were filthy! They felt so grungy that I hated to touch them. I remember they were stored in my parents’ attic for years. Then, when they moved from the farm into town, Mom gave the magazines to me and I have had them in various storage places for more than 25 years. They went into our recycle bin. Another couple boxes had my old workbooks from elementary school. They were just as dirty and yucky to touch as the magazines. Into the recycle bin they went. The scrapbooks that I made in elementary school were in the similar condition. Nothing creative here, just mimeographed seasonal designs on construction paper that we cut out, perhaps colored or added some paper fasteners to in order to make moving arms/legs, or paper doilies for a lace effect. Our creations were displayed around the classroom for a week, then we pasted into the scrapbook. Recycle bin. I had to make decisions, and I just could not keep something that no one would want to touch. Some boxes included papers from a charter member of our local genealogy society; her daughter gave the items to me after her mother passed away. Where possible I incorporated these items into my collection. I was able to give a few things to the Iowa Genealogical Society. But, still other papers went into the recycle bin. I knew the daughter had given as much as possible to the local historical society before she gave things to me. Some genealogy reference items dating from the 1970s and 1980s were simply out-of-date. I also found a box of items from my great aunt, also a charter member. Those items were treated much the same as those from the other charter member. The sorting, however, also had some bright sides. I found some family genealogy papers. Many of these papers were in good shape and I was able to file them. 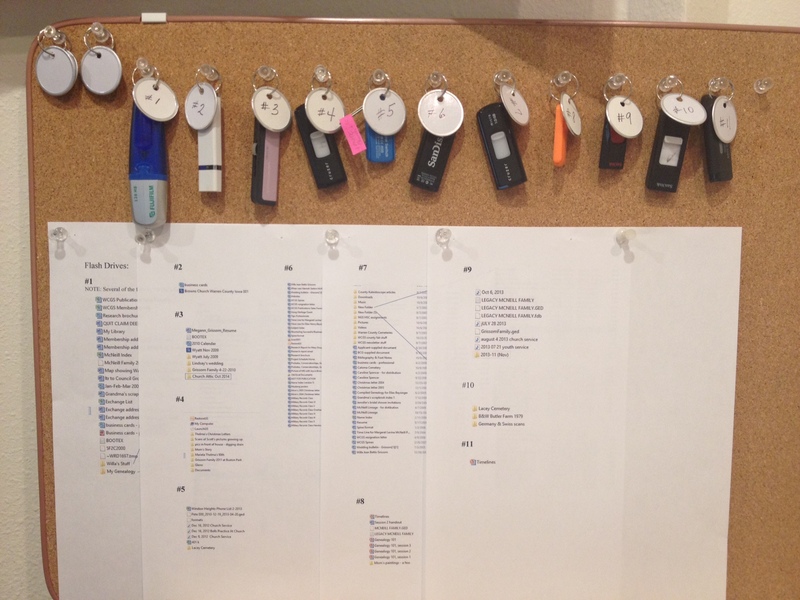 My work earlier this fall, to create hanging files, paid off! Now, I could just file papers where appropriate! As I work through this sorting process, I’m finding it easier to sort through printed material and other papers than to sort through artifacts or photographs. So… I needed to refer to a book that I knew is in my library, but I could not find it! I also needed to refer to another book that I thought was in my library, but I couldn’t find it either! I checked this stack of books and that stack of books, as well as the less-than-organized books on various shelves. I finally found the first book, but realized I don’t have the second one after all. My library needed an organizing touch. After donating periodicals that had occupied space on my shelves and with some other reorganizing, I knew I could do better. I surveyed my books for probable categories. 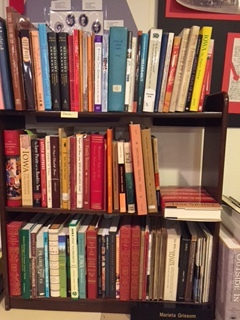 Then, I went through all the stacks and created new stacks by logical topic, i.e., Revolutionary War, Civil War, World War II, NARA, American Indians, various states, Transportation, Weather, Writing, etc. After determining how much space to allow for each category (allowing room for expansion), I organized each section alphabetically by author. Iowa needed its own bookcase, and several counties within Iowa got their own bookcase. 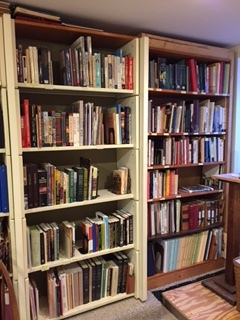 And, naturally, genealogy reference books occupy nearly four shelves of still another bookcase. As a side note, I use LibraryThing.com to catalog all of my books. I should have checked there to see if I had the second book. I love LibraryThing because I can access my library catalog from my iPhone when I am considering the purchase of a new book. Currently I have 525 genealogy/history-related books cataloged. Mine is not a huge library, but large enough that having it organized is very helpful. Ta da! Final result: Today I can find any book in my library within seconds! I’m on a cleaning roll! Focus: genealogy and history periodicals! A bunch are going to leave this house! Duplicate copies… out of here! If I can find it at Dunn Library, Simpson College (only 4 blocks from our house), out of here! Genealogy periodicals… donating to the Iowa Genealogical Society (IGS)! If I need to look at it later, I can go there! Nearly everything pertaining to our local genealogy society can be scanned. I’ve scanned some things and tossed; I’ve scanned other items and prepared originals to give to our current president. Hopefully, just by addressing periodicals, I will make more than dents in the quantity of stuff in my genealogy room; serious holes would be good, craters best! Net result: hole the size of our car trunk which was filled to capacity as we hauled them away.